As with any investment vehicle there are pros and cons to investing in property in Australia. It is important to know what the benefits are and what the negatives or risks are before you invest. So what are the pros and the cons of investment property in Australia? Let’s have a look at the pros first. These are the benefits or the reasons why we would want to invest in property. Pro number one is leverage. It is very hard to go to a bank and request to borrow 80% of the value of the stocks you’re going to purchase. Banks will rarely lend the average investor money to purchase stocks in the stock market. However the bank will often be happy to lend you up to 80% of the value of that property if you say that you’d like to purchase an investment property. Sometimes a bank will even lend you 90% or 95% of the value of that property. This means you can buy a larger asset than if you only were using your own money. Let’s look at an example. Say you have $10,000 and you invest it in the stock market. If the stock market grows 10% in one year you would have $11,000. Now let’s say that you use your $10,000 as a 10% deposit on a $100,000 property. A 10% return in one year would have your property grow from $100,000 to $110,000. Your gain would actually be $10,000 or 100% because you used leverage to invest. Pro number two is that it’s a hard asset. This means the fluctuations aren’t necessarily going to be as severe. Property markets do have their fluctuations. They do go up and down. But the stock market is generally seen to be more volatile than the property market. It is a hard asset and it is less volatile. This can be great news for you as an investor. Pro number three is control and improvements. 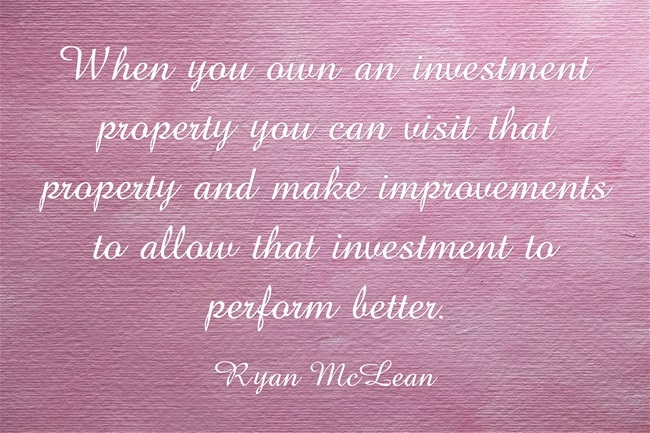 When you own an investment property you can visit that property and make improvements to allow that investment to perform better. You can do renovations or paint the house. You can mow the lawn or do up the gardens. You can market the property better. But when you own stocks, you often don’t have any control over how the business is run. You simply get the returns if the business does well. By having the control to improve upon your property you can actually make your investment perform better for you. Pro number four is that you can get cash flow and capital gains. You can certainly do this with stocks and other investment vehicles as well. But one of the great things about property is that the right investments could generate you positive cash flow every single month. You can also get capital gains on top of that. Property has cash flow and capital gains just as stocks have their dividends. And pro number five is that property is generally seen to be more stable. There are often fewer fluctuations in the property market than there are in the stock market. Your money can often be seen to be more secure. This will obviously depend on the property you purchase and the area you purchase in so always seek professional advice before investing. So we’ve explored five pros. But what are some of the cons of investing in property? Con number one is that property is not very liquid. In order to get your money out of property you need to sell the property. This can take a significant amount of time. Even if you get an immediate sale you must enter into negotiations. Then you have your cooling off period and your settlement period. It could be four to six weeks before you get access to your money. With other investments the process is much quicker. If you sold your stocks today you could have your money in your bank account this afternoon. So property is not as liquid and money doesn’t move as fast as it does with the stock market. Con number two is that leverage can actually work to a disadvantage. We will return to our earlier example. Say we took our $10,000 and invested in a $100,000 property and it goes down 10%. We would actually be losing $10,000 or all of our investment if we were to then sell that property. Leverage can be great but it can also weigh you down and put you at greater risk. Always be careful when you’re investing and get professional advice where possible. Con number three is issues with property. Part of what you give up investing in stock is control over the company. But you then don’t have to worry about the company. No one calls you and demands that you fix any problems. The business runs itself. However it is your responsibility to fix anything that happens with your property. This usually isn’t a massive issue because you’ll probably have a rental management team managing the property for you. But bad tenants or problems with the property can become a strain on your time. You need to put a lot of effort into keeping the investment going. And con number four is the barrier to entry. You can start investing in a stock market with as little as $500 to $1,000 in some cases. However you would be very hard-pressed to find and buy an investment property using only $500 or $1,000 of your own money. You generally need a minimum 5% deposit. A lot of investors will ideally offer a 20% deposit so they don’t pay lenders mortgage insurance to invest. So investment in a $500,000 property would require a deposit of $100,000 in order to have that 20% deposit. That sort of money is not easy to come by. Property investment has a higher barrier of entry to invest and could prevent you from investing sooner than other investment vehicles might. 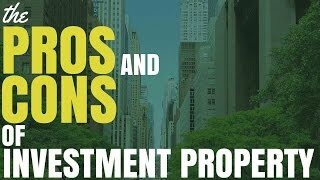 So there you have the pros and cons of property investment. I hope that gives you something to think about with regard to the risks and the rewards, and whether or not you think property is for you.